Review: I went into a pretty strong Scott Pilgrim (the comics! 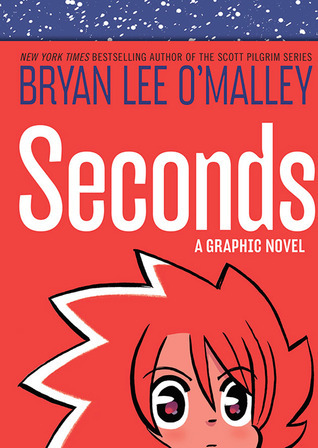 still haven’t watched the movie) phase in undergrad, so I put Seconds on my to-read list the second Bryan Lee O’Malley mentioned it on tumblr. Basically, I’ve been waiting to read Seconds for years, and it was just as awesome as I expected, though the story took a turn I didn’t expect. Seconds centers on Katie, a chef who opened up the restaurant Seconds. After several years, her life and the people in her life have changed. She’s looking to move on as well by opening up a new restaurant… until something goes horribly wrong,and she discovers a magical way to redo it all again — and again, and again. Naturally, there are consequences and strange things afoot. The comic has a heavy thread of narration throughout, which lends Katie’s journey a kind of melancholy and enchanting tone. In keeping with Scott Pilgrim, the humor is quirky, relateable, and serves to tell you a lot about even peripheral side characters. One reference to Scott Pilgrim had me grinning in delight (the bread joke, if you know the one). Though the art is fashionable and adorable, the story definitely can get a little chilling. I regret reading it at night (whoops). The art, of course, is great — the colors, the style, the way little asides and speech bubbles were arranged were all top-notch to me. More than once, I found myself wishing I was nearly as stylish as the characters in Seconds. This is definitely a book that you can admire visually, along with enjoying the story. Recommendation: Buy it now! This is a seriously amazing read.